Florida home buyers are not required by law to survey their residential property before they close on their new home. However, it’s a good idea to do so because any number of issues can materially affect the value of the property and the ability to sell it. A certified property boundary report, or “survey,” outlines and defines all of the unique characteristics of land and its improvements. The creation of a physical survey is done by a surveyor licensed to perform physical surveys by the State of Florida. As part of the creation of the survey, a licensed surveyor will visit the property and record certain information about the location. He or she will not rely solely on records or plats filed with the county recorder’s office, but those documents will be reviewed to aid in preparation of the final document. The surveyor will make an independent, professional determination about the land and all improvements found thereon. He or she will use experience and professional expertise, as well as Global Positioning Systems (GPS),Computer Aided Drafting (CAD), Robotic Survey Systems (RSS), and Laser Scanning to create a boundary survey. Location of the road right of way. If you buy oceanfront property with an existing fence, the survey will identify it as well as if it conforms with federal laws and local ordinances. From the perspective of an experienced Florida real estate attorney, there are several reasons that someone buying Florida residential real estate should have a survey before the closing of the transaction. Regardless of how long the property owner has lived in the home, or how established the neighborhood is, lawyers all too often negotiate boundary disputes between the owner and neighbors. Here, property owners have been assuming that their property lines were in one place, when in actuality the legal description determines their boundaries in a different location. This can be a serious problem for a new buyer who wants to put up a privacy fence, to tear down a pier, or to pave an access road or gravel driveway. The new buyer may discover that his or her new neighbor disputes the right to do so because of confusion over their property boundaries. The survey explains where the visible boundaries are for the lot that is being purchased and warns of potential property line disputes. The certified survey itself provides admissible expert evidence regarding whether or not the legal description of the property contained in the sales contract and closing documents is correct. It gives the buyer something to show a neighbor after closing, and, if there are inaccuracies revealed in the legal description, it gives the buyer a basis to object to the title to the property before closing. The survey will include details regarding everything that exists within or atop the land. This includes buildings, fencing, and other improvements. The surveyor will confirm whether or not the improvements on the property conform with applicable state or federal laws as well as other restrictions (county codes, city ordinances, etc.). These can include regulation of things like the height of homes in a particular community (where the restrictions set homes at two or three stories), as well as parking restrictions, frontage requirements, and federal environmental agency regulations. If the surveyor discovers the location, or the dimensions, of an improvement is in violation of any statute, law, code, or ordinance, then the surveyor puts the buyer on notice that the property is in violation (this information will be included on the survey under the surveyor’s notes). 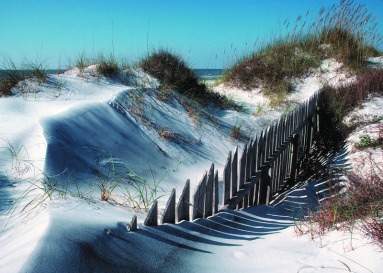 Florida has particular requirements for the placement of residential utilities because of our state’s unique environmental characteristics. For example, the Florida Division of Water Resource Management oversees the protection of the quality of Florida’s drinking water as well as its ground water and wetlands. Buyers and sellers alike may be unaware of the particular regulations that apply to the location of utilities on the land. Surveys will reveal the utilities existing on the land. These include underground drains, sewer systems, power cables, and above-ground utility poles and wiring. Buyers must understand that upon taking ownership, they are subject to the rules and regulation of these utilities. If the Florida utility provider has the right of access to the site, then it may have the power to force the buyer to cut back trees as well as limit where additional improvements (like a swimming pool) can be built. Easements are established under Florida Statute 704.01 as an implied grant of access on the land to another person or entity. One common example is a utility pole or light fixture placed on the residential lot. In a survey, easements will be shown and described insofar as who has the right of access on the property, the extent of the easement, and its basis. The survey may also provide reference sources for the easement, including real estate records, municipal ordinances, and deed restrictions. Hidden easements are not easily seen by a walk around the land itself. These include underground utilities where the utility company may have an easement to access the land in order to repair or maintain buried pipes, drains, or cables. Right of way easements are recognized in Florida Statute 704.01 as an implied grant of access on the land tract to another person or entity. These easements exist because there is no other reasonable way to access the other person’s land except by over the land owned by the seller. Right of way easements may be owned by another person (like a neighbor) or by a legal entity (like the local electric utility company). In a survey, these easements will be shown and described insofar as who has the right of access on the property, the extent of the easement, and its legal basis. The survey may also provide reference sources for the easement, including land owner agreements filed in the real estate records or utility requirements found in municipal ordinances, county building codes, or deed restrictions established at or before the time that a residential division was platted. The survey will include references to natural characteristics of the land that may impact its use. This includes any ponds, creeks, or lakes as well as water wells. Note: the survey may not go so far as to delineate detailed environmental issues particular to Florida tracts, including underground springs or wetlands. These are outside the scope of the standard land survey and must be evaluated by environmental engineers, etc. Additionally if there are any manufactured objects impacting the use and enjoyment of the land, they will be identified in the survey. These include things like sheds, fences, and docks. The surveyor will walk the property, looking for physical markers left on the property to identify the dividing lines of ownership. He or she will then reference the instruments recorded in the county real estate records, which also identify the ownership lines for the parcel. In Florida, there may be land records with surveys that are outdated and not as accurate as those done today with technological advances like CAD or GPS. The land’s markers may have moved or traveled over time, as well. The survey will identify any discrepancies between the recorded instruments and the ground itself. The survey will not decide the ultimate property line of ownership. However, the discrepancies will advise the property owner of the need to confirm the actual boundary lines before sale or transfer. A topographic survey or a “topo” survey is a specific purpose survey. It is generally performed to determine features of the property and any elevation changes, for use in new construction on raw land. In Florida, government agencies, including city building departments, often require a specific survey before granting building permits and allowing construction to commence. Restrictive covenants are found in the recorded real estate records for the property. In Florida, these restrictions exist to protect the community or development over time, by prohibiting certain things from being built or used on the land. Zoning laws also exist to define and prohibit certain uses of the property. Setbacks are one type of zoning requirement which will be identified in a survey. A common setback is a limitation on where any fence can be placed on the lot, or how far back from the street the dwelling (and any improvements) can be built. Some communities do not allow fencing of front yards, for instance. Fencing of back yards may be required to be placed a certain number of feet from the property line or alleyway. Additionally, zoning laws may require mailboxes be placed at a certain location on the property. The survey will also reveal if a violation of the setback exists on the land. If so, then the issue will need to be corrected by the seller before the buyer closes on the transaction. There are many issues to be considered when buying residential property here in Florida. Each home must be evaluated for own set of issues, including issues that may be found on a boundary survey of the property. Any one of the above issues can materially affect the value of the property and for the seller to find a ready, willing and able buyer. Buyers can rectify survey issues before closing by requiring the seller to fix the problem (i.e. removing a fence or removing an other item encroaching into an easement). After closing, any problems that a survey would have revealed likely will be the buyer’s problem. An experienced Florida Real Estate Lawyer can help a buyer in dealing with an issue found on a survey, including deciding whether or not to close the transaction. The good news is that most Florida real estate lawyers, like Larry Tolchinsky, will offer a free initial consultation to answer any questions.